It’s hard to believe based on the abhorrent weather of late, but spring is coming any day now (Don’t stop believin’). And with spring comes a whole new wardrobe. Moving those bulky sweaters back into storage sounds like a daunting task but think about exchanging them for the chambray button-downs! Ahh, just the word “chambray,” despite emasculating me whenever I say it aloud in conversation, brings a warm smile to my face. Say it. Chambray! Khakis used to be a dirty word, or something a Blockbuster video employee wore. But now that we’ve grown up, there’s the rare occasion for when jeans simply won’t do. And this, my friend, is where the khaki comes in. (BTW, those iconic GAP ads…? Miles wore them. Humphrey wore them. 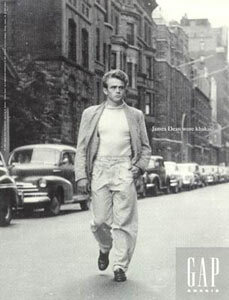 Even James Dean wore them). In recent years, designer lines like Steven Alan for Dockers or Save Khaki have produced the classic trouser in a European cut, slimmer and more flattering and, thank God, without the pleats. But this season, J. Crew has re-introduced the khaki’s slightly rebellious cousin in slim-fitting cargo pants. Let’s be clear: this is not the exaggeratedly baggy version you wore back in the 90’s to see Korn live, but a dressier one. Granted, the Cargo is inherently workman-like, but I dig a clothing contradiction, specifically this cross section of preppy and rugged. It doesn’t make a ton of sense, but it’s a fine variation on the traditional khaki. Speaking of Steven Alan….Spring drizzles are inevitable, so be prepared. This Steven Alan jacket is classy and pleasant, yet sharp and masculine. It also comes prepared with a hood, which may not sound like a commodity, but unfortunately, fashion doesn’t always factor in practicality and weather preparedness. So, props to Mr. Alan for protecting our hair. Bonus point: Military green never goes out of style. Just ask the military. It’s been a couple of years since Michael Bastian began designing a special Hampton-referenced line for Gant and the results have been consistently impressive. Preppy whilst holding up a sign with “I’M PREPPY” written on it in bold-impressive. The look is quintessentially American (for example, check out his tennis-themed sweaters from last year), but not necessarily Patriotic. Old established brands aside (Tommy Hilfiger, Ralph Lauren), no young designer has captured the essence of American fashion like this New York-born newcomer who’s injected purity and timelessness to just about everything he’s produced. I love the shirt above because it’s like the Voltron of preppy Oxford shirts. A blue, a pink one, a red one, etc.—all came together to make a complete unit of Oxford awesomeness. Sadly, unlike Voltron, it does not come with a lazer sword. I can’t find a link for the shirt online because, presumably, Bastian is waiting until Spring itself to make it available. We live in a crazy world, where high-end fashion lines are appropriating sweatpants. I’m anticipating a response or two from the comment section about how this particular selection is misguided, but hear me out. These aren’t the shlumpy Champion sweatpants you bought from Modell’s. These are rather passable for pants, with the working button-fly, a back pocket for a wallet and two side pockets for iPhones and change. They’re also made from durable yet lightweight cotton, a skinny fit for the trend-inclined. And while I wouldn’t necessarily wear these to work, I would easily put them on for a walk in the park with my dog Barrett. If the Moncler version is too rich for your blood, I just purchased the Topman response, the Jersey Cargo Pocket Joggers. I’ll admit that the Levi’s x Opening Ceremony Chambray Coverall (not just an overall, but a coverall!) is an non-traditional item even for me (and I have a pair of gold sneakers with wings on them). But the genius of wearing one article of clothing made of chambray made to look like two articles of clothing excites me somewhat. Aside from the fact that there’s a wink of acknowledgment to the potential wearer’s laziness, there’s something historically exciting about rocking the early 1900’s coal miner look. I mean, there’s retro, and then there’s retro. A helpful saleswoman at the perfectly stocked Levi’s Concept Store in the Meatpacking district told me that if you’re a tall gent, avoid these. They work only for the dudes 5″10 and below. Hooray for being short! Recently, some of my friends have shown up to parties wearing ties. I respect this a ton. Props to those arbiters of neck fashion. And so a few months back, I read about this great lil’ tie company, Co. 807—a husband and wife team based in Boston making high-quality, vintage-inspired ties. I love their stuff so much, I’ve bookmarked the site and check back often for inventory updates. Recently, I spotted this denim tie, which, to me, is genius. I’m talking heart palpitations. Again, I’m all about the style contradictions and a formal tie made from the quintessential informal material is certainly one of the big ones. How rebellious would this feel wearing this to shul? Quite. I highlighted a similar sweater to this one in my Fall Picks, but I can’t help being somewhat repetitive here. There’s something truly nostalgic about the knit weave, like someone you know made this for you. Maybe your grandmother, or your crazy cat-lady aunt. And then there’s a misnomer about cardigans not being appropriate for the Spring; perfect for a breezy night, or wear it instead of a windbreaker. Breathable, yet sophisticated. This one’s rather pricey but practically selling out everywhere, and I have a feeling that a Henrik Vibskov cardigan lasts forever so it may be worth it. This shirt had me from “made from Italian linen,” quite possibly the most comfortable fabric in use today. Subtly colorful. Polos will always be synonymous with the Spring. A quality, 100% cotton pullover is the perfect low maintenance article of clothing, comfortable and impossibly east to pull off. You can find one basically anywhere, but that doesn’t mean you should buy them anywhere. Try Fred Perry, Lacoste, or once again, J. Crew. Or if you’re looking to put your own signature on it (literally), Rugby offers you the opportunity to create your own design by picking the color, the embroidery, and the initials. I picked a skull and crossbones for the example here but it may be too edgy for some of you traditionalists out there. I’m pretty sure the initials feel a bit tacky to me. This isn’t a bathroom towel. Boat shoes have run the course for the past couple of years, and some magazines are even declaring them passé. But there’s a lot of love for boat shoes here even if the old guard insists that you wear them exclusively on boats (we’re Jews. We don’t do boats). This Spring, I’m feeling both the buck shoe and the desert boot, but the Saddle shoe (pictured above) is a braver, more interesting choice. It takes a special man to pull these off, but they’re still admirably sleek and old timey. I scored an awesome pair of Vans Spectators inspired by the Saddle shoe and I get compliments on them wherever I go. However, if you’re not connecting with the Saddle shoe–understandable– see if you can pull off the moccasin currently available through J. Crew’s In Good Company store. Before I started splurging on custom suits (my size, a 35R, is really hard to find in stores), I bought my suits at H&M and Uniqlo out of necessity. But here’s the thing: You don’t have to spend upwards of $1,000 for a wonderful cotton suit. I mean, it’s cotton! Stores like Uniqlo and H&M don’t always make it so easy to find a matching jacket and slacks, but when you do, which I have done many times over, you’ve found a suit that can easily last a few seasons for under $200. There is no excuse for wearing wool suits in the summer–this seems to be a common transgression in Jewish communities. And while magazines like GQ and Esquire will have you believe that you need a Thom Browne for Brooks Brothers or a Band of Outsiders suit, you don’t. All you need is a little patience, a little ingenuity, and a little style. Did you just convince me to buy sweatpants? I’m glad boat shoes have run the course.Those saddle shoes are kinda badass. thinking of visiting Levi’s for the coverall! !